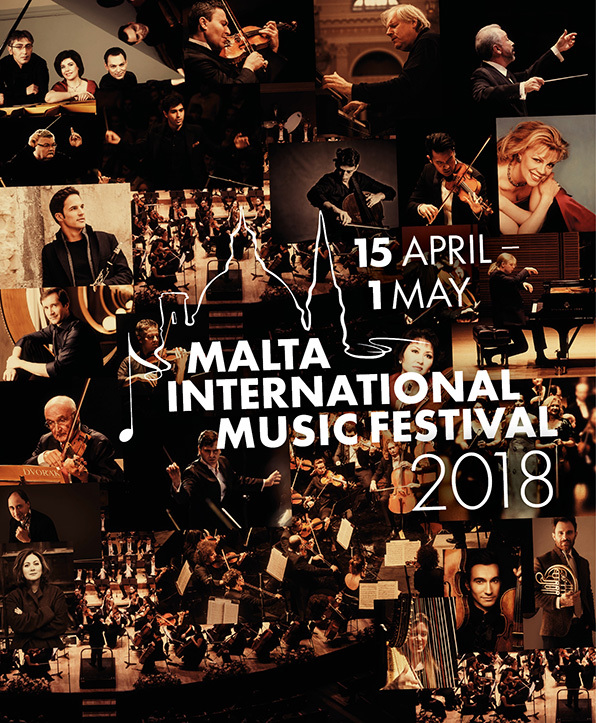 Together with the Malta Philharmonic Orchestra, the European Foundation for Support of Culture presents the 6th Malta International Music Festival, from April 15 to May 1 in Valletta, the capital of the Republic of Malta. The Festival will be the largest and the most prestigious classical festival probably ever organized in Malta and will be supported by the Valletta 2018 Foundation and the Malta Tourism Authority. During the Festival, performances will feature world-acclaimed artists including violinist and conductor Salvatore Accardo (Italy), legendary pianist Grigory Sokolov (Italy), violin superstar Maxim Vengerov (Germany), one of the best pianists of today – Nikolai Lugansky (Russia), one of the most talked about violinists within musical media – Ray Chen (Australia), famous violinist Aiman Mussakhajayeva – rector of the Kazakh National Institute of Arts (Kazakhstan), cellist Narek Hakhnazaryan – winner at the XIV International Tchaikovsky Competition (Armenia), clarinetist Andreas Ottensamer – soloist of the Berlin Philharmonic Society (Austria), pianist Denis Kozhukhin – winner of the Queen Elizabeth competition (Belgium), virtuoso pianist Julia Zilberquit (U.S.A.) and other eminent musicians. and narrating a documentary series about the Malta International Music Festival to be broadcast on international TV channels. The role of the resident orchestra of the Festival will go to the Armenian State Symphony Orchestra whose artistic director and conductor is Sergey Smbatyan. Among performing artists at the Festival will be Dmitry Sitkovetsky, outstanding violinist, conductor and director of various festivals, Sergei Stadler, artistic director of the Petersburg Concert, a large concert organization and principal conductor of the St.-Petersburg Symphony Orchestra and Tigran Hakhnazaryan, one of the most progressive conductors of the day, artistic director and principal conductor of the Yuzhno-Sakhalin Chamber (Symphony) Orchestra. At the Festival, compositions of known Maltese composers Joseph Vella, Albert Garcia, Charles Camilleri and Alexey Shor, resident composer of the Malta Philharmonic Academy, will be performed. Concerts of the Festival will be held at the most prestigious and historic halls of Malta – the Mediterranean Conference Centre (Valletta) and the Robert Samut Hall (Floriana). The following news agencies have signed up as principal information partners of the Festival: TV Medici, Mezzo TV, TVM Malta, RAI, RTR-Culture, First Channel of Armenia, BBC, Euronews, Washington Post, New York Times, “Malta Times, Maltese Herald, Orphrey Radio” and Classic FM and many others.